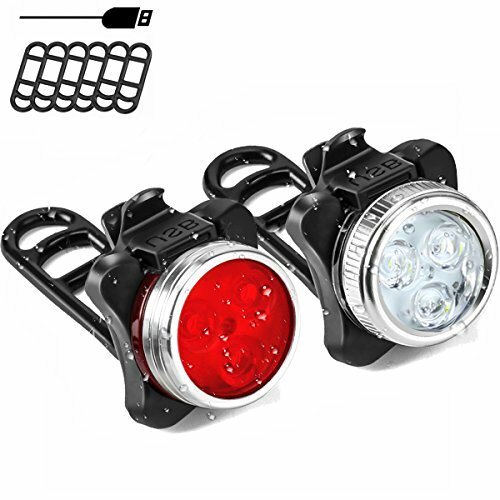 SOKLIT Small Lightweigt and Bright LED Bike Light Supply More Safety Lights for your Child, Friend and Family During Hiking, Driving, Camping and so on. High intensity aluminum alloy materials. It will be more durable. Suitable for most bicycle for those handbear's diameter within 22-38mm. They are locked with elastic bands so easy to remove them. Not only can be used for bike, but also can be used for helmet, backpack or hat. Batteries: Rechargeable 650 mAh Lithium batteries included only recharge via usb or outlet. 4 Light Mode Options and Discharge Time of Full-charging about the headlight and taillight. SOKLIT offers 18 months warranty and the lifetime dedicated advisory to assure your long-term enjoyment. USB Rechargeable & Waterproof -- It builds in 650mAh rechargeable lithium battery that cab be recharge via usb, outlet, power bank, pc and etc. IPX4 Waterproof for more convenient to carry out during raining. Easy to Install & Widely Use -- Small and compact premium bike lights are easy to mount or remove for they are locked with elastic bands that can be stretched up to 4.72''. It also can be installed on your backpack or hat, shoes and where you need the light. It suitable for the hand bear's diameter within 22-38mm. Premium Aluminum & Silicone Materials -- High intensity aluminum alloy materials will be more durable when you are hiking, driving, camping or other outdoor activities and so on. Bright white headlight gives you 360 degree protection. Bright red taillight can be used as emergency flashlight on night for safety. If you have any questions about this product by SOKLIT, contact us by completing and submitting the form below. If you are looking for a specif part number, please include it with your message.